A Good Deal for You, Your Community and the Environment. The Habitat for Humanity General Store in McCormick is a nonprofit home improvement store and donation center which sells new and gently used furniture, appliances, home accessories, building materials and more to the public at a fraction of the retail price. 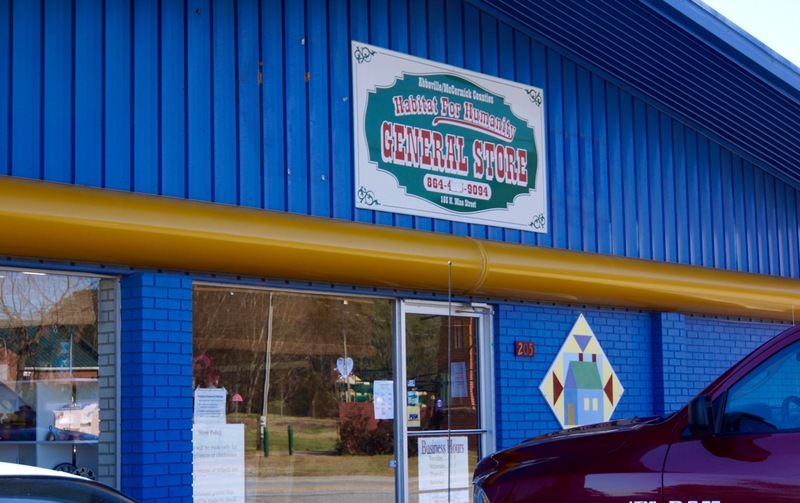 The General Store is independently owned and operated by the local Habitat for Humanity organization. Proceeds are used to build homes, community, and hope for residents of McCormick and Abbeville counties. Got stuff? Make a donation! Remodeling, cleaning out, down-sizing or just getting organized? The Habitat for Humanity General Store can help you declutter your home, workspace or business. We put the proceeds from selling your donations to good use by building homes and hope in our communities. Our store accepts donations of household goods, furniture, appliances and building materials. Bring your donations to the store during business hours shown above. Call the store (852-9094) during business hours to arrange free pick-up of those items too big to fit in your car. The Habitat for Humanity General store is a place to put your talents to work. From customer service to furniture repair, the General store offers volunteer opportunities geared toward individual interests and skills. By giving your time, you can help us do more to support local building projects for those in need. Habitat for Humanity volunteers, both on construction sites and in Habitat ReStores, have helped more than 600,000 families in need own decent, affordable homes. Call us (852-9094) to see how you can get involved.